Rob Mitchell has been continuing his great work each week in the Rubicon Office’s on the Midleton Heritage Project. Having compiled a database of references in the witness statements to the IRA in Midleton during the War of Independence, he has also been looking at local castles in the area, and is currently compiling information on those who lived on Midleton’s Main Street during the 1901 Census. In his latest post Rob looks at local connections with the U.S. state of Pennsylvania. William Penn was born on October 14th 1644. He was the son of Sir William Penn, an English admiral and politician who sat in the House of Commons from 1660 to 1670. The younger William was educated first at Chigwell School, by private tutors whilst in Ireland, and later at Christ Church, Oxford. After a failed mission to the Caribbean, Admiral Penn and his family were exiled to his lands in Ireland. It was during this period, when Penn was about fifteen, that he met Thomas Loe, a Quaker missionary, who was maligned by both Catholics and Protestants. Loe was admitted to the Penn household and during his discourses on the “Inner Light”, young Penn recalled later that “the Lord visited me and gave me divine Impressions of Himself.” After many years, the free-minded William Penn announced publicly that he was a Quaker. He did so in an attempt to slip past charges stating that since Quakers had no political agenda they could not be subject to laws that restricted political action by minority religions and other groups. In 1669 Penn travelled to Ireland to deal with many of his father’s estates. Whilst there he attended meetings and stayed with leading Quaker families. He became great friends with William Morris, a leading Quaker figure in Cork, and often stayed with Morris at Castle Salem near Rosscarbery. 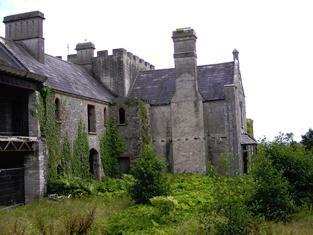 He also owned a castle and estate which he inherited through his family in Shanagarry. Known as ‘Penn Castle’ it still stands today and offers a permanent reminder of East Cork’s links with Pennsylvania. As the prosecution of Quakers began to accelerate rapidly and with religious conditions deteriorating, Penn decided to appeal directly to the King. Penn proposed a solution which would solve the dilemma—a mass emigration of English Quakers. Some Quakers had already moved to North America, but the New England Puritans, especially, were as hostile towards Quakers as Anglicans in England. Some had even been banished to the Caribbean. In 1677, a group of prominent Quakers that included Penn purchased the colonial province of West Jersey (half of the current state of New Jersey). That same year, two hundred settlers from the towns of Chorleywood and Rickmansworth in Hertfordshire and other towns in nearby Buckinghamshire arrived, and founded the town of Burlington. In 1682, East Jersey was also purchased by Quakers. With the New Jersey foothold in place, Penn pressed his case to extend the Quaker region. Whether from personal sympathy or political expediency, to Penn’s surprise, the King granted an extraordinarily generous charter which made Penn the world’s largest private (non-royal) landowner. In possession of over 45,000 square miles, Penn became the sole proprietor of a huge tract of land west of New Jersey and north of Maryland (which belonged to Lord Baltimore), and gained sovereign rule of the territory with all rights and privileges (except the power to declare war). The land of Pennsylvania had belonged to the Duke of York, who acquiesced in the transfer, but he retained New York and the area around New Castle and the eastern portion of the Delmarva Peninsula. In return, one-fifth of all gold and silver mined in the province (which had virtually none) was to be remitted to the King, and the Crown was freed of a debt to Admiral Penn of £16,000, equal to £2,120,595 today. Penn first called the area “New Wales”, then “Sylvania” (Latin for “forests or woods'”), which King Charles II changed to “Pennsylvania” in honor of the elder Penn. On March 4, 1681, the King signed the charter and the following day Penn jubilantly wrote, “It is a clear and just thing, and my God who has given it me through many difficulties, will, I believe, bless and make it the seed of a nation.” In 1682 in England, he drew up a Frame of Government for the Pennsylvania colony. Freedom of worship in the colony was to be absolute, and all the traditional rights of Englishmen were carefully safeguarded. Penn drafted a charter of liberties for the settlement creating a political utopia guaranteeing free and fair trial by jury, freedom of religion, freedom from unjust imprisonment and free elections. East Cork’s connections with William Penn are being celebrated as part of the The Gathering. The William Penn Symposium will be held in The Kilkenny Shop, Shanagarry on 25th August 2013. For more details on the event see here.